In this article I am going to detail a horse racing arbitrage strategy that I like to use occasionally to mix up my betting patterns. This strategy is quite profitable and is a good way of taking extra value from the bookies. If you are unfamiliar with arbitrage and want to learn about arbitrage betting. I recommend reading Does Arbitrage Betting Work. This strategy as it is a good way of moving money from bookmakers to exchanges but also getting some value in the process. First off you are going to need a low commission betting exchange such as Smarkets or Matchbook and bookmakers that offer best odds guaranteed. First off we look for a horse that is a close back and lay price at a BOG(Best Odds Guaranteed) bookmaker (back) and low commission exchange (lay). For this example I will use Smarkets. In the picture above you will see the horse Copper Baked is priced at 1.91 with a number BOG bookmakers. Smarkets lay price is close to bookmaker back price. We can offer a lay price that matches the current BOG bookmaker prices. When the lay bet gets matched we then place the back bet at a BOG bookmaker. From the above you can see that if the odds on Copper Baked stays the same price or comes in further we stand to win £90.90 for Bet365 and lose £90.01 from Smarkets for a £0.89p profit. If Copper Baked loses we win £100 minus the 2% commission from Smarkets £98 and lose the £100 from Bet365. The key to this method is the large potential upside from the BOG (Best Odds Guaranteed) promotion. The Best Odds Guarantee promotion means that if a horses starting price drifts after you backed it you will get paid at the higher starting price. So if Copper Baked price drifts before the off. And went off at a price higher then 1.9 then Bet365 would pay out at its starting price under the BOG promotion. For example if Copper Baked drifted to 2.5 before the off and won we would then be paid £150 by Bet365 and lose only £90 from Smarkets. This would equal a profit of £60 when our risk of loss was only ever £2. 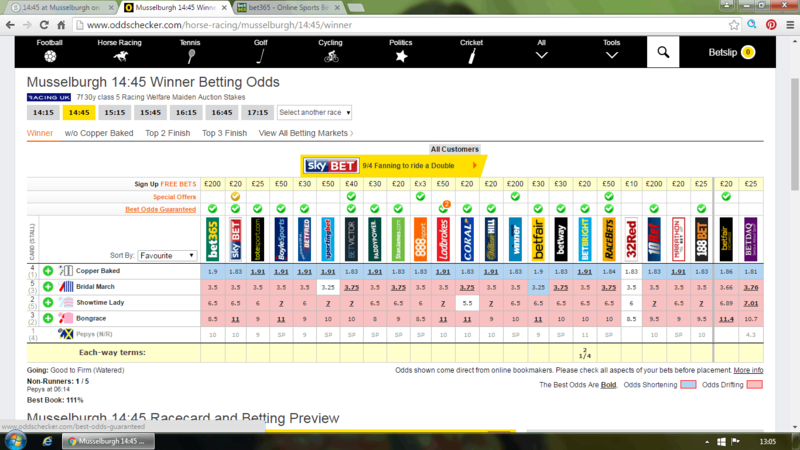 In this example we get a horse rated at 2.5 for odds of 31.0. This does happen fairly regularly in the horse racing markets. From using this method there is always a much larger upside then there is downside. Also by sticking to shorter favourites. It doesn’t look like conventional arbitrage to the bookmakers. This method is a great way of building your trading bank alongside matched betting and arbitrage. In order to make the most of this horse racing arbitrage strategy you will need an exchange that offers lower commission then Betfair. In the long term paying 3% less commission is going to going to add to much greater profits. Matchbook are a good option. They offer a number of horse racing markets with ever increasing liquidity. Take your arbitrage betting to the next level with Rebelbetting. Laying first is a tad risky but I can certainly see the potential here. A good risk to reward ratio.